Minnesota has more miles of paved bike trails than any other state, but doesn't work to promote the trails as a top tourism draw. They aren't marketed heavily here at home, or outside of the state. But the money spent by recreational cyclists has meant a rebirth for some small towns, and more communities hope to benefit as the bike trail network expands. Some towns and businesses are pinning their development hopes on visitors with wheels. A portion of a bike trail near Bemidji. Bike trails in Minnesota are attracting more users, but some say the state and local communities should do more to promote those trails, and bring more tourism dollars to the region. THE HEARTLAND TRAIL, SLICING 48 MILES THROUGH PINE WOODS from Park Rapids to Cass Lake is one of the oldest Rail to Trail projects in the country. Business is good at Northern Cycle in Park Rapids, a few blocks from the start of the Heartland Trail. "For us, if it wouldn't be for all the rental and the tourists coming up to ride the trail, we probably wouldn't have a bike shop in Park Rapids," says the owner of Northern Cycle, Bob Williams. Williams says many of his customers are from places like the Twin Cities and Fargo-Moorhead. But lately he's renting quite a few bikes to people from as far away as New York or California. They come to Minnesota for the lakes, and are pleasantly surprised to find so many paved bike trails. "I think Minnesota should probably do a little bit more advertising on their bike trails, because we've had people come in from New York - all over the country - and say what a beautiful area this is," says Williams. "Minnesota is really friendly as far as biking goes. We hear that comment all the time." Williams thinks the growing popularity of cycling among middle-aged, middle to upper-income people means there's a future for the communities and the state's bike trails. Several towns in northern Minnesota have started to cash in on the Heartland and Paul Bunyan Trails, and more traffic is expected when those trails are connected. That would allow cyclists to travel between Park Rapids, Bemidji and Brainerd. It's difficult to know just how much money cyclists pump into the tourism economy. 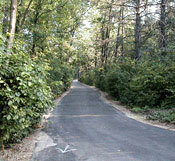 The most recent study by the DNR in 1998 estimates trail users spent $5 million. The majority of the money was spent along the Heartland and Paul Bunyan Trails in northern Minnesota and the Root River route southeast of Rochester. Bike trails are credited with the revival of some dying small towns. Perhaps the best example is Lanesboro, along the Root River Trail. "Before the bike trail came you could roll a bowling ball down Main Street at night and not hit anything. It was pretty quiet," says Lisa Weaver, executive director of the Lanesboro Agriculture, Commerce and Tourism Association. "It's completely transformed the town. There's a lot of tourist-related business now - shops, restaurants. There's about 25 lodging establishments now where I think there used to be one." Northern Cycle, a bike shop in Park Rapids, credits much of its business to the cyclists who ride the nearby Heartland Trail from Park Rapids to Cass Lake. The owner of the shop, Bob Williams, says the state should do more to attract tourists to the state's bike trails. Weaver says most of the visitors to Lanesboro come from the Twin Cities, Iowa and Wisconsin, and the number of tourists is steadily increasing each year. That's likely because Lanesboro has become a destination, not just a stop on a bike trail according to Joan Hummel, a marketer for the Minnesota Office of Tourism. "The Root River Trail helped put Lanesboro and some of those other towns on the map. But at this point there's a lot of people who go to those towns and never get on the trail, because so much else has developed in those towns," says Hummel. Hummel says Minnesota bike trails are marketed as an extra amenity, another reason to visit the state, or a reason to come back next year. And Hummel says Minnesota doesn't build bike trails as a tourist attraction. "I think first and foremost you're building them for the folks who live in that area. I think drawing visitors, drawing tourists, is a secondary part of building trails," says Hummel. That sentiment is echoed by Larry Young, the head of the Joint Economic Development Commission in Bemidji. He says the draw of cycling along paved trails through the woods complements the already strong summer tourism business in northern Minnesota. He says perhaps more important, the trails add to the cultural amenities that help attract new or relocating businesses. "Trail systems become part of the available recreation and cultural amenities people look for in an area. So, it's kind of increasing the critical mass for communities like Bemidji," Young says. "They can have some of the amenities they have in other communities where they live in the Twin Cities, they don't have to give them up to come north." Young says he expects the economic benefits of bike trails to accrue naturally with each new section of trail completed in coming years. Since there are no immediate plans to market Minnesota as a bike trail mecca, it's likely the towns that will cash in are those that use the trails as a way to build themselves into a tourist destination.